Even the best run business can occasionally encounter a significant crisis event. 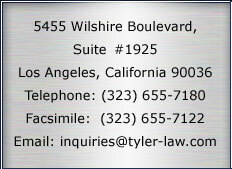 At Tyler & Wilson, our attorneys understand the host of challenges faced by businesses when crisis events occur. When you face a criminal investigation or a finding of immediate jeopardy, must report abuse or an adverse event, encounter an environmental or other physical plant disaster, we are ready to assist you in mitigating liabilities arising from these crises. Our attorneys will assist you in addressing the regulatory and certification needs, the wage and hour as well as workers compensation responsibilities, the landlord-tenant and premises liability obligations, insurance and coverage concerns as well as criminal and other issues that often accompany or follow crisis events. Knowing that prompt response is the best way to mitigate the consequences of a crisis, Tyler & Wilson provides clients access to attorneys around the clock to see them through harrowing times. Tyler & Wilson attorneys will advise you with regard to the direction of human resources, the preservation of financial resources, the mitigation of media negativity, and all else necessary during and after a crisis event so that you can manage and minimize the resulting damage. For information about our firm and its lawyers and/or assistance with your risk management and/or crisis response needs, please contact any member of Tyler & Wilson, LLP directly or email us at Inquiries@Tyler-Law.com.